This film is often compared to The Unseen, a film that follows a similar plot line released in 1981 and often not favourably with reviewers world web wide proclaiming The Unseen to be far superior. 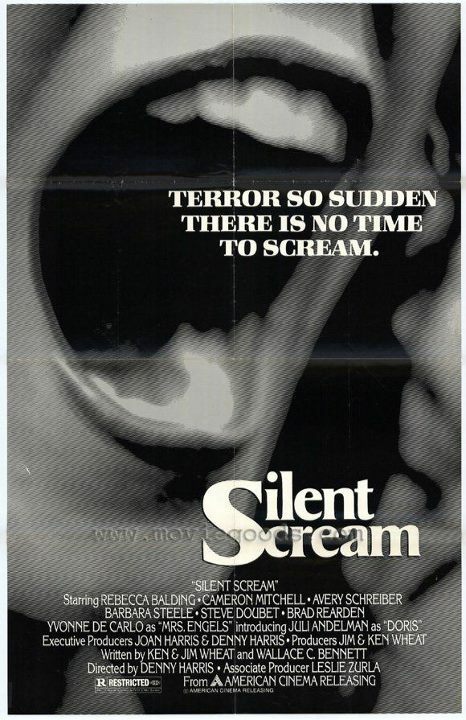 I am here to disagree, I believe Silent Scream is a brilliant horror tale in it’s own right and never seems to get the credit it deserves due to these unfair comparisons with an entirely unrelated film. The first thing I’ll say about this film is that it is absolutely dripping with atmosphere. The film fashions itself in the same vain as the classic 1950s gothic horror which often featured a house high on a hill where evil lurked, and it pulls it off perfectly. From the moment the house is first glimpsed it seems foreboding and the darkened corridors and rooms littered with cobwebs strike a kind of dread into the viewer that is rare amongst films of the time and ever rarer today. Unlike other cheese laden horror films of the time, Silent Scream has some top notch performances. You will find no cheese or over the top acting here, everything is played straight and it makes the film all the more terrifying as the madness and terror that later engulfs the plot is made all the more believable due to these performances. Here we also have two veterans of the genre joining the cast, Cameron Mitchell and Barbara Steele, giving the film a leg up on it competitors. Given the chilling atmosphere, incredibly strong performances and a gloss which so rarely seen in films of this period, it baffles me why Silent Scream is as overlooked as it is. I implore you, seek it out if you haven’t already seen it! You won’t be disappointed!